A nonprofit trade group that advocates a pro-business agenda. House Speaker John Boehner, among other Republicans, wrongly tweeted that a recent “study” found “74% of small businesses will fire workers, cut hours under #Obamacare.” Actually, no more than 13 percent of the small businesses surveyed said that. 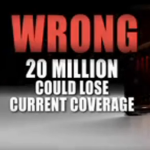 The U.S. Chamber of Commerce’s latest onslaught of television ads continues to miseducate voters about the potential impact of the health care law. The U.S. Chamber of Commerce claims in a TV ad that the Congressional Budget Office says unemployment “could top 9 percent in 2013.” Maybe so, if Congress doesn’t change current law — specifically if it fails to extend tax cuts, fails to patch the Alternative Minimum Tax that threatens to raise taxes on more than 31 million Americans, and also allows big spending cuts to take effect. But CBO also said that wasn’t a prediction of the future. The U.S. Chamber of Commerce puts a new twist on a tired old falsehood about “government-run health care” in one of its new ads attacking Democratic lawmakers. We noted other dubious claims as well. Lobbying group representing business interests. Leans Right-center. This week, we resolve two disputes about who said what, and find that a government report cited as support for a charge about ineffective government programs is nonexistent. NBC’s "Meet the Press" hosted a debate between Colorado Sen. Michael Bennet and the Republican who is trying to unseat him, tea party favorite Ken Buck. We’re reviewing their exchange, and, if we find they have their facts wrong, we’ll post a piece on Tuesday.